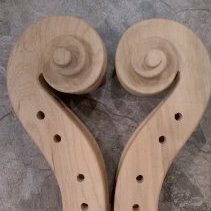 This is a transfer from another CNC thread, where I think there are separate discussions to have on CNC use for users, and the separate discussion of the other impacts on the art of violinmaking. Nathan Slobodkin wrote: "I passed over this topic for several days and now that I have read it have good idea of how Mr. Ludd felt. The use of this type of machine seems like an awful lot of work to create something which completely bypasses the artistic possibilities of the medium. There is a reason we value Italian Baroque era instruments which were made by or under strict control of one man over French 19th century instruments essentially made by a committee over machine made German and Japanese instruments of the 20th century. The essence of art is the individuality and personality of the work which unconsciously reflects the society and experience of the artist as well as his health, the weather, what he ate for breakfast and how friendly his wife felt the night before. While small mistakes might occur in hand work the artist accepts that possibility in exchange for having the freedom to push an arching slightly fuller or swing the curve a bit faster on a corner depending on his mood. This is how one produces a body of work where each piece has a unique personality which reflects that of the artist or craftsman. For those with physical or fiscal issues which require that a machine replace the traditional apprentice in rough wood removal there is nothing wrong with machinery but the individual traits of the instrument do not come from the final scraping or last knife cut. They are also dependent on the direction and vigor of tool use at a much earlier stage of production." While I can understand the aesthetic of entirely hand-made violins, it really comes down to individual preferences and values. There is also an obvious attempt by some of the top makers to carefully copy every scratch and knife cut of valuable old instruments, which is a very different form of complete abandonment of individual artistry and creativity... but I certainly admire the skills it takes to do that. I'm sure every CNC user has their own reasons and goals for getting into it. I have spent 10 years basically making instruments the hand-carved way, and don't regret it. But I don't see my variable results as much more than an inability (or impatience) to hack the wood into what I want it to be... so my own "artistry" is nothing I value myself. Also, for the clients that I have come across, the main issue is acoustic performance and playability, with looking good being secondary but still of importance. I haven't heard anyone fawning over the imperfections of my handiwork. This is all in addition to the physical necessity to offload whatever hand-stress I can, or risk becoming unable to do any work at all in a few years. That's probably the primary motivation for me, and I am comfortable with the idea of building instruments that look basically the same and lack my usual oopsies. My goal continues to be (and always has been) acoustic and playability for high-level players, and looks that are acceptable. Traditional purists might not like them so well, but those types tend to be other makers, and not players. There appears to be room in the market for those who use CNC and those who don't. Given that, I have a hard time feeling too dogmatic about it. Personally and for my own work, I'm right there with Nathan to a great degree, but it doesn't bother me in the least that other folks are making great use of machines. Points taken Don. 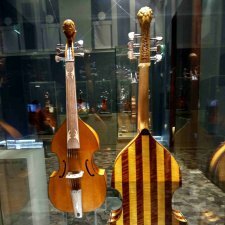 I agree that the average musician does not have the eye to see the difference between the CNC and hand worked instruments and I also have great respect for those craftsman who can accurately reproduce past masterpieces. However making an instrument that expresses individuality within the very narrow confines of a functional musical instrument is I think both harder and more lasting artistically than anything machine made or copied. I once examined a beautifully done copy of an Amati violin made in Florian Leonhardt's shop while he examined one of mine. When I remarked what a nice violin it was he handed mine back to me and said "yes, but this one will have a life of it's own." Nothing wrong with either provided they are approached correctly. In the case of Don, CNC allows him to experiment and continue building. I've learned some valuable information/ methodology reading Don's posts. I think we can all be thankful for that and in his own way of being artistic. Here's to many more experiments and insights. CNC mass production is another story. Just as hand-made mass production is a different story. I like to think that it's not the tool that matters, but the person using it. If Strad used CNC or a sharpened spoon, he'd probably still make Strads. Either way it ain't rocket science... it's more complicated . I share Dons opinion about the musicians point of view. Their main concerns are sound and setup. I have no finished opinion about that, but my gut feeling is that every outline might have an "ideal" arch shape which should/ could be adapted slightly to meet the wood properties. Using CNC only for the rough shape does not make a lot of sense, since in violins/violas that is the least time consuming task. Don's contributions to this forum and to the larger understanding of how violins work are very valuable but I am discussing artistic issues. I think that to a large degree the tool does matter in that certain tools will automatically make certain shapes such as the gouge making the channel or the size and shape of the plane that blends it into the arch. If I decide to make a flatter curve between the purfling and the crest of the edge on a particular instrument I use or make a different tool rather than fussing with a rounder one. While it is true that the tool used will make obtaining certain shapes easier or more difficult, I'm thinking of my situation where I know in great detail what shape I want to end up with, and won't compromise just because the tools I happen to have make a different shape more conveniently. In the end, there's always scrapers, which can be shaped to whatever works. It may take longer, but it gets there. But since my goal is to reduce all hand stress to a minimum, I'd really, really like to get a CNC shape close to what I want to end up with... which may be a painful process (not physically). This gets to the bottom of an issue that has affected me for the last decade or so that I have been involved as 1/3 of our shop system of team expertise in old instruments: I am often the first to spot a composite violin. There are various reasons for this, but one is that later makers do tend to think that the tool makes the shape. Old makers, without a set of eight German scroll gouges and no full set of Mittermeyer gouges in every depth and width, had it built in to the process that the shape they made depended entirely on their vision and their skill at executing that vision, not the tool they used. In contrast, I see many of the tags that make a fake or bad replica visible center on depending on the tool to make the results. I will assure you, Nathan, that a channel made to the sweep of a gouge does look very different from one chewed out with a smaller gouge according to vision and skill. I don't know much about art but I believe there is no strict definition and modern arts pretty much show it... IMO (material) art is more about the final result than the method used to create it. It's the observers view what he considers art and what not, and those opinions can and DO change with time. Remember that Van Gogh died poor and did sell just one painting, do you think that modern artist became known and recoognized imemdiately (think Andy Warhol...)? They were first judged by "rules" of their day but their outcome was ahead of it's time and finally found its audience. I think we are in similar process, these tools were not available decade ago and now everyone can get one and learn to use it. Yu can see the video of the Fusion modelling of violin by CAD designer in the CAD thread. He clearly has no idea how violin works, he read some articles about violin geometry got Strad poster and went ahead with modelling. He got the arch nice shiny and smooth in CAD but it doesn't even come close to average VSO arching in final shape (and with his CAD thinking he never will come closer). The knowledge of the creator will come through the medium no matter what tools he uses. I bet what Don is going to create will be "just" another Noon violin while the CAD guy wil create just another VSO (or DVSO, D for digital) unless he takes some extra time to study more. I know few makers who hired CAD guy to create CNC programs and copied tooloing and jigs from internet pictures and started making instruments that on the first glance look good (and asking prices are often hefty), but on closer look you can see all the beginner mistakes that better makers learned to avoid on first few builds. If Don is willing to sell me his cad model could I create a "Don Noon" ? And if so, why would Don carry on making physical violins if he could make more money by creating software models and selling those ? In ten years time I might wake up one morning and look through the proliferation of websites and decide if I want to make a Darnton -Noon - Hargreave - or Zygmuntowicz etc,etc. These matter a lot for what you end up with in sound and appearance. The CNC isn't going to do all that. I did say in ten years time. By then your software and website could be more sophisticated than today with 3D modelling using lasers, or something else. I would also assume you sold your patented "Don Noon" ground and varnish, with videos on how to get the "Don Noon" finish. One could also subscribe (at a fee) to your personal attention interactive web teaching course. I love reading you guys, and I have very little to offer except the viewpoint of a particular kind of player. I was chatting with a colleague the other day about instruments and he suddenly interrupted me and said,” I don’t care about my cello as anything except a tool.” I’m not sure how serious he was, but that comment reflects the attitude of many people who don’t give a damn how it’s made, or by whom or where or when. I rather pity him. I’m a professional cellist, but I am an amateur Instrument lover, in the sense that I know very little, but I know enough to appreciate ithe things that you guys are discussing here. A month or so ago I posted a question asking how many of you guys made your own purfling, I was disappointed to find that the maker of my instrument did not, and was only slightly mollified to find that most of the people here do not either. I want a great instrument made by a great maker, and I’m willing to pay for it. Some people, like my colleague, don’t care about anything except results and price. I think there’s room for everybody. I'd like to add that art doesn't necessarily has to be handwork. And aesthetic changes can easily be performed on pre made CNC parts. 'Handmade' can mean gross rapid underpaid piece work. And CNC can mean careful individual thoughtful and aesthetic work. Direct human attention is the essential magic ingredient, more than methodology or tooling. Of course, the quality of that attention matters greatly also. Let’s not confuse Art and Craft. Art is knowing what to do and Craft is knowing how to do it. Handwork is intrinsically no more artistic than machine work as both are equally capable of distorting intention. Machines are just more relentless at it. Nathan, I'm not referring to the level of finish as much as the resulting lines. Sometimes tools have a way of imposing their own will. Scrapers are a good example. I think we may both be arguing the same side. While some things such as outline are close to 100% controllable by the craftsman other things like arching and edge work are going to reflect the planes and scrapers used. The craftsman can exercise control by changing the tools but given those tools there are finite possibilities as to how the arch will blend into the edges. I also think that the shape develops way back in the carving. To the best of my ability I am carving the shape with my gouges then taking out the "waves" left by the gouge using my planes and then scraping out the marks of the planes to as smooth a finish as I desire. While I want the curves and lines to be smooth I don't usually remove all the tool marks from the surface because they add some interest and a directionality to the shapes. Also leaving vestigial marks from the larger tools proves that the thing was not made with a CNC and appeals to the people who really prefer knowing the work was done by hand. It is important to me to make instruments which are recognizably mine and do not look like everyone else's. In a few years I think it will take a very educated eye indeed to differentiate the work of makers who use a lot of machinery. Handwork is intrinsically no more artistic than machine work as both are capable of distorting intention. Machine work adds a layer of indirectness between the artist and the object being made. Consider making a straight line in some medium. A higher clean precision can be reached with mechanical assist. But all the minute variances and corrections of a highly skilled freehand version allow a fuller 'imprint' of the human presence and intent behind the work. The right balance for a particular person and purpose is of course itself an artistic choice. Every tool (gesture, word, pencil, knife, brush, CNC, etc) is at least one degree of separation from intention. Intention being ‘The Big Idea’. Tools selection is more a question of literacy and suitability rather than humanity.